The I.D. hatchback, shown here as a concept, wil be the first vehicle from VW's I.D. electric family. 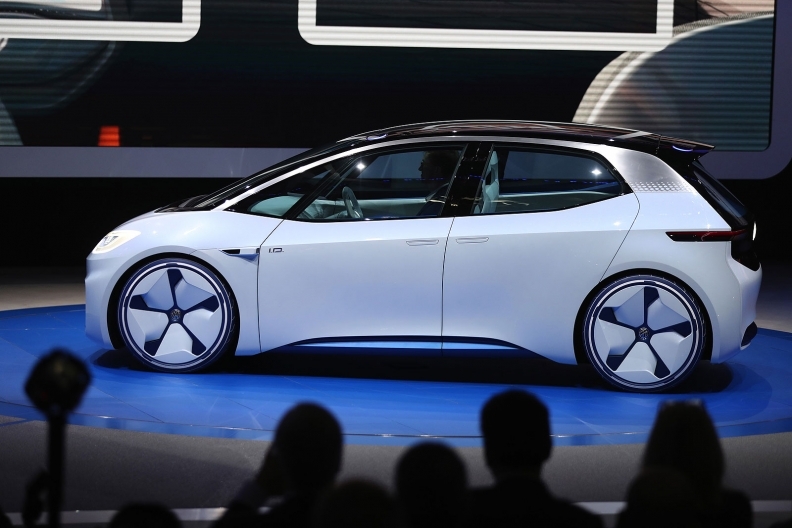 WOLFSBURG -- Volkswagen brand expects to beat the company's stated target of selling 1 million electric cars by 2025, the marque's EV chief, Christian Senger, said, citing demand in China and Europe, as well as untapped potential in the southern hemisphere. VW's push into volume production of EVs comes as rival Tesla struggles to scale up manufacturing of its Model 3, which is also aimed at the mass market. After its emissions scandal broke in 2015, VW unveiled an ambitious plan to become a world leader in green transport and deliver 1 million electric VW-brand EVs a year by 2025, based on the MEB platform. Efforts by China, the world’s largest auto market, to tackle air pollution have helped trigger a surge of investment into the EV sector, cutting battery prices while raising the German brand's optimism on the appeal of the technology. "One could argue that we will well exceed the 1 million (target) from the MEB," Senger, head of electric mobility at the brand, said in an interview. Other German automakers are also investing heavily in EVs. BMW has said it wil start mass producing electric cars in 2020, while Daimler’s Mercedes-Benz plans to launch more than 10 EVs by 2022. Senger said latest signs that demand could beat expectations come from national sales organizations such as Moeller Mobility Group in Scandinavia, which distribute VW cars across markets and regions. "In the cycle plan where we again and again undertake forward planning for up to 15 years, we see that the markets even want more (electric) cars than we have earmarked." Besides Europe, China and the U.S., VW sees additional potential in other regions including South America that are not reflected in its sales targets, Senger said. The executive also said VW needs to gauge whether its battery production capacity would allow it to serve demand in the southern hemisphere at all. To stoke mass demand, VW is aiming to sell its EVs at the price of conventional combustion engine cars, drawing on MEB synergies and falling battery costs, Senger said. Designed to underpin nearly 30 battery-driven models from four group brands, ranging from the Golf-size I.D. hatchback to the Vizzion sedan, the MEB platform will allow the VW group to gain savings in a production cycle due to economies of scale. Waiting lists for the E-Golf have grown to more than 12 months after state and industry-backed incentives led the model's price to drop by about a third to about 25,000 euros ($29,020), according to VW. In Germany, two-thirds of 1,800 respondents to a March survey by advisory firm Deloitte said they would opt to buy a combustion engine car as their next vehicle, with 23 percent favoring hybrids and only 7 percent an all-electric model. "We are looking at growth rates here that we have in no other product," he said. Demand is always volatile, "but the indicators we have shown that it (beating the 1 million goal) can work."